This student submission comes from my former student Donna House. Her topic, from Geometry: deriving the distance formula. Two guys (Cyniscus and Protogenes, but they usually went by their nicknames, Cy and Skippy) were hanging out on a Saturday afternoon in ancient Greece. Cy wanted to go to McDolops and get a Filet-O-Squid, but Skippy wanted to go to Athens Fried Pheasant. While they were discussing this, their buddy, Pythagoras, walked by. So, Pythagoras suggested they go to What-a-carrot and, since they served pomegranates and pancakes, Cy and Skippy thought that was a great idea. But how would they get there? Cy wanted to walk east down Aesop Avenue to the agora, turn left, and walk to What-a-carrot. Skippy wanted to walk north up Draco Drive to the temple, turn right, and walk to What-a-carrot. 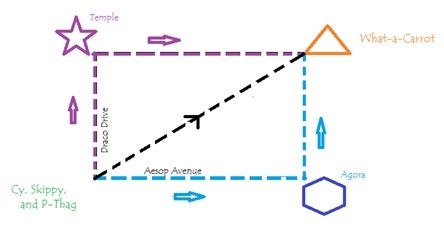 If Aesop Avenue is 4 stadia long and Draco Drive is 3 stadia long, how far would they walk using Cy’s route? How far would they walk using Skippy’s route? How far would they walk using P-Thag’s route? What formula did you get? d(distance) = ? It is late and you are sitting at your desk and in the middle of planning your new tower project or antenna support [you are a ham-radio operator] and you’re getting all of the materials, parts, accessories list, etc. together so you can dig deep into your bank account for the needed money to purchase all of the needed supplies. In your excitement you realize you just can’t wait to get that antenna support mast or that tower you just acquired high in the air so your signal will travel the earth and beyond. In your planning stage you have looked over your proposed tower or mast site and found the ideal place in which to “plant” it in the ground and you know how high it will be when it is installed. Now you ask yourself where to put the guy wires for it on the ground…you walk around the area and pick some good locations for each of them hopefully conforming to recommended safe installation procedures. In your observations, you realize that each guy wire will have to be a different length due to obstructions and Murphy’s Law getting in the way. It never fails, Murphy is always looking over our shoulders and picking on us as ham radio operators! Ok now, stand back Murphy…each guy wire has to go in a specific location whether “Murphy” likes it or not and you know how high the tower or support mast, pole, etc. is so then it hits you… and you ask yourself….how long will the guys [wires] have to be for the locations I have picked out? I don’t want to have to buy more guy wire than I need. After all, my wife says I am cheap! You look at the tower, pole, mast etc. and your location for the guy wire at ground level and say….well the mast is 50 feet tall, so the length at the location of my first guy has to be at least as long as the mast is high but a bit longer…but how much longer will it have to be due to the angle of the guy coming off of the tower if it is 70 feet away? See the example drawing below for our proposed setup and to get the answer to our question in our fictitious installation. 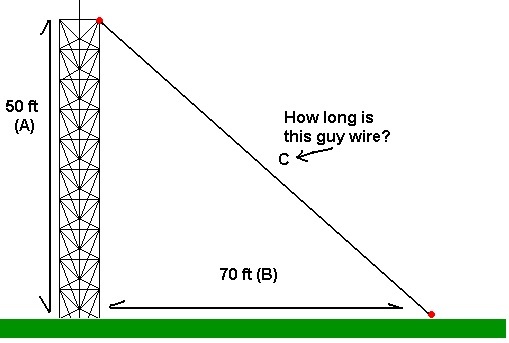 attachment point and the distance to the first guy is 70 feet…how long is the guy wire! Math can become boring and tedious for some students (shocking! – I know.) An activity that will help them learn while having fun will help them remember the lesson. One such activity is useful in learning the distance formula. If your classroom is not large enough, arrange to have your lesson outdoors or in the gym (at least this portion of the lesson.) Divide the students into two teams and have each team line up in an “L” shape. For example, if you have 10 students on a team, have six or seven line up in a straight line and the remaining students form a line at a right angle to the end of the first line. The number of students in each line is not important as long as the lines form a right angle and each team is lined up the same way. Give the two students at one end of each team a ball and tell them to pass the ball from one student to the next until the ball reaches the end of the line. The goal is to pass the ball from one side of the team to the other. The team who passes the ball fastest wins the match. Repeat this game until someone figures out to throw the ball from one end of the line to the other. (You may need to say, “Think about how you can get the ball to the other end faster.”) This will complete your right triangle! Now you can have a discussion about how going from one end to the other directly is faster than having to go around the corner. (The shortest distance between two points . . .) Someone will probably mention the Pythagorean Theorem and that will give you the perfect opportunity to guide them through the derivation of the distance formula! Pause the video between 1:00 and 1:05 (before the audience’s answers are revealed) and have the class vote for the answer they think is correct. Don’t give the students too much time to think – you should simulate the time the contestant has to answer (about a minute.) Tally the votes on the board (and find the percentages) so the class can see the results. Compare the class percentages with the audience percentages. Now resume the video. Stop the video at 2:18 so the correct answer is given, but the smaller squares are not yet revealed. Say, “Would you have lost $15,000 on this question like this contestant did? How do we know that 25 is the correct answer?” Help the students set up the problem. At this point you can draw the circle and the radius, then discuss how to find x2 and y2. This will lead to the formula for the Distance Formula!